The sorceress is fierce and unforgiving in the 720 Ways to Win slot The Enchantment from IGT and High 5 Games. She is stealthy and powerful. Cruel and relentless. But if you can overcome her, all of her riches are yours for the taking. In a magical world where dragons reign and danger looms, The Enchantment offers you a unique opportunity to win seismic bonuses and epic rewards. This game features an innovative bonus round that offers a minimum of 8 free spins, with the possibility of up to 96 initial free spins – and you can re-trigger more free spins within the bonus round! With 720 ways to win thanks to the Multiway Xtra feature and a creative 3-4-5-4-3 reel configuration, this game will be unlike any other you’ve ever seen before. 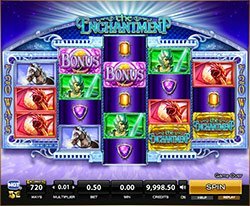 Set on a mesmerizing background, the reels of the slot are adorned with the Sorceress, her horse, various colors of jewels, a knight, a dragon, a scatter, a wild and a bonus symbol. Enchanted Free Spins – Land the bonus symbol in any position on 5 consecutive reels to win 8 free spins! If you land this same sequence of symbols again after your win your initial free spins, you’ll earn an additional 8 up to a maximum of 240 free spins. Enchanted Wilds – The Wild symbol will substitute for almost all other symbols except the free spins bonus symbol to complete winning combinations when possible. This symbol can appear on reels 2, 3 and 4. MultiWay Xtra – With MultiWay Xtra you get 720 different ways that you can win in the slot. Wins can happen from left to right, or from right to left.